Perfect for submersible return pump applications. The barbed fitting will allow the Vectra pump to use soft tubing for plumbing, while the included screen will keep foreign matter from entering and causing damage to the pump. S1/M1 Barb and Screen Kit: Barb fitting will work with 3/4" ID soft tubing. The Ecotech Marine Vectra Barb and Screen kit will allow your Vectra pump to use standard soft tubing such as braided vinyl or silicone tubing. 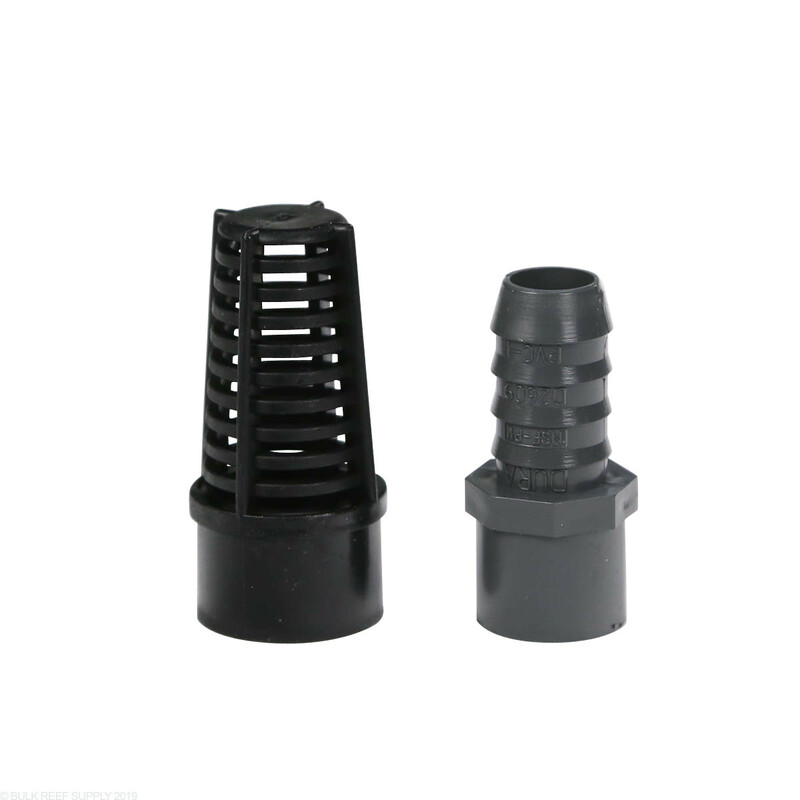 The barbed fitting will be a traditional slip fitting into the output of the Vectra pump and does require PVC cement for a worry-free connection. The blue collet on Vectra pumps may be tight on barbed fittings, we recommend using a small amount of plumbing solvent and apply a large amount of force to seat the fitting in securely. The included screen fitting will keep large debris that would normally cause damage and extreme wear to a pump from entering the pump. Since the screen is normally being pulled into the pump no solvent is needed to connect the screen to the pump inlet. Me and a buddy bought the M1 pump and both of us ordered the barb fitting. After reading these reviews we got sanding paper and a rubber mallet but guess what??? they fixed w/e issue that was going on because both of the fittings that came in this kit slid right in with little effort. i put a tiny bit of glue and done perfect pump. Why in the world Ecotech Marine would release a screen & barb kit which then has to be glued to the quick-connector is beyond me. Why not just provide a fitting with the quick-connect part in one piece? This smacks of laziness & lack of understanding of their customers requirements on Ecotech's part that you would never experience with other more established manufacturers like Eheim. Try as I might I couldn't get the barb to fit all the way into the female quick-connect collar. I had to traipse all over town & spend another $20 on primer & adhesive. I managed to break the screen trying to fit it as the fitting was so tight. Completely ridiculous accessory for a very expensive pump. This fitting should be done properly and supplied with the pump. Does not go past a 1/4 inch. Very very very tight. Now granted they are technically the correct size and should fit like a glove, but for some odd reason they only go in about a quarter of an inch before stopping. YOU WILL HAVE TO MODIFY THESE FOR THEM TO WORK PROPERLY. I would try using sand paper to make it smaller and go from there. Better yet buy the threaded adapter they make. I'm no dummy when it comes to making things work, but for spending $10 I shouldn't have to do this. Shame on you Ecotech Marine. I had the same issue with this 3/4 inch barb for return, It wouldn’t fit. I sanded it down quickly with a dremel and glued this piece to the vectra coupling, using a transition pvc to abs glue which is required, and it sealed perfectly. I have two vectra M1s, on one I used this set, and on the other glued schedule 40 pipe strait to the pump couplings. In both cases, the fit was so tight that I either could not get the pipe to seat all the way or when gluing them together I had to hold them for an exceeding long time because if not the bard set/ pipe would slide out on its own. I also recall getting frustrated and breaking out the sand paper to adjust the fit. The problem appears to the the couplings that come with the pump themselves and not so much this set. However, given this set is supposedly for the M1, I would have thought the fitting would fit better then a plain old piece of schedule 40, but they did not. Just as Mark said the barb fitting that comes with this does not fit into the pump without sanding the sides down. The screen does fit into the intake part of the pump but even that seems a little iffy. The barb fitting does not fit the Vectra's M1 return fitting - I had to sand the fitting in order to glue it. The screen however, fits like a glove. 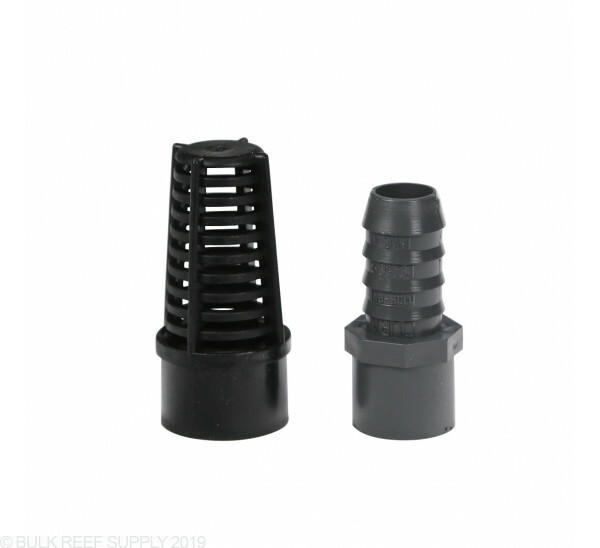 If you only want the barb bitting, save yourself $5 bucks and get the Gray Pipe Adapter Spigot x Barb (3/4") sold here on BRS for $4.99 instead. You'll have to sand it down as well since it's basically the same fitting provided in this kit. Will this fit the S1 too? Correct! The S1 and M1 have the same input/output size and will work with both. What’s the m1 screen diameter? Is it a 1 inch screen? Great question! Yes, it is a 1" screen to fit the 1" input of the Vectra M1.